This article by Trent Toone was originally published in the Deseret News. Historic Temple Square, in downtown Salt Lake City, attracts millions of visitors each year. There is much for LDS Church members and nonmembers to see and experience, whether it’s taking photos of the Salt Lake Temple, listening to the Mormon Tabernacle Choir or walking the colorful and well-manicured grounds. While moving about, guests are greeted by a small army of smiling sister missionaries who speak a multitude of languages. The Christus was beautiful. It was the best part. Temple Square is more than just the temple. The visitors centers and historic sites are places where people can come to dedicated grounds and feel peace and tranquility. They are an oasis from the cares of the world where guests can feel closer to God and have their thoughts uplifted toward the heavens. A scaled model of the Salt Lake Temple sits in the South Visitors’ Center on Temple Square. Few might recognize the name of Charles J. Thomas. Anytime you have a huge construction project, people are going to be interested. Thomas had a little caretaker’s cottage on Temple Square when the temple walls were probably 10 feet high. He took care of the grounds, cleaned up after people and gave tours to anybody who came by. He did that for a long time. Around this time, a local bookseller spent time at Temple Square giving tourists cards with the Articles of Faith printed on them, Lund said. The future of LDS visitors centers was greatly influenced by an important event that occurred in 1893, according to Reid L. Neilson, assistant church historian and recorder. At that time, the Latter-day Saints were isolated in the West, and Utah had been unable to gain statehood. Mormons had been disrespected in the national press for the practice of plural marriage. Nevertheless, LDS Church leaders viewed participation in the Chicago World’s Columbian Exposition as an opportunity to put its best foot forward. They organized a series of exhibits featuring unique aspects of Utah, including the Mormon Tabernacle Choir, pioneer crafts, textiles and minerals. The First Presidency, many members of the Quorum of the Twelve Apostles and more than 7,000 Latter-day Saints traveled to Chicago that summer for the national event, Neilson said. In 1902, the church built its first visitors center on Temple Square and called it the Bureau of Information. Larger versions of the visitors center were constructed in 1904 and 1910, the article said. In the decades that followed, the LDS Church continued to have a presence at world’s fairs in Dresden, German (1930); Chicago (1933-34); San Diego (1935-36); San Francisco (1939-40); and beyond. One key figure for the church who helped plan and carry out some creative and successful ideas during this period was future LDS Church President Gordon B. Hinckley. Gordon worked on the project for months, calling on the talents of artists, photographers, builders and other artisans who lent their professional skills to the complicated undertaking. The effort and anxiety were well worth it, however. Few displays were more popular at the Golden Gate International Exposition than the church’s exhibit, which drew more than 1,400 persons on the opening day alone and some 320,000 over the 13 months of the fair’s operation. The Mormon Pavilion at the fair left a lingering legacy immediately observable in the art, dioramas and multimedia technology of today’s visitors centers. Drawing upon success from the world expositions, the LDS Church began building visitors centers at temples and later at some historic sites in order to tell its story and accommodate curious visitors. Centers were built in Mesa, Arizona (1951), Los Angeles (1955), New Zealand(1958), Idaho Falls (1960) and Oakland, California (1964), Lund said. The visitors center in the southeast corner of Temple Square was opened to the public in 1978. Both Temple Square visitors centers were remodeled in 2001. Today, the most visited exhibit in the South Visitors’ Center is a small model that displays the interior of the Salt Lake Temple, Lusvardi said. In addition to “The Christus,” other prominent exhibits at the North Visitors’ Center include the films (available in various languages) “God’s Plan for His Family” and “8 Stories,” which features the lives of eight LDS missionaries, and an interactive exhibit, “Finding Faith Through The Book of Mormon,” which introduces guests to the Book of Mormon. Missionary work has been a natural result of telling the Latter-day Saint story. Each exhibit, film and display is designed to communicate basic gospel doctrines in an interesting and easy-to-understand way. There is also an effort to customize content and presentation for the region in which the visitors center is located, Lusvardi said. “Visitors centers are an opportunity for people who might be a little hesitant about stepping into a regular sacrament meeting. People find their way in and learn about us,” Lusvardi said. Another unique feature of visitors centers, as opposed to learning about the church on the internet, is they are located on land dedicated by prophets and apostles for temples or historic sites, Lusvardi said. The most effective element at all visitors centers are the sister missionaries called to serve at the sites. They missionaries are what guests remember long after they return home, Lusvardi said. “We’ve done repeated research on that, and guests say the best thing you have are the sisters,” Allen said. 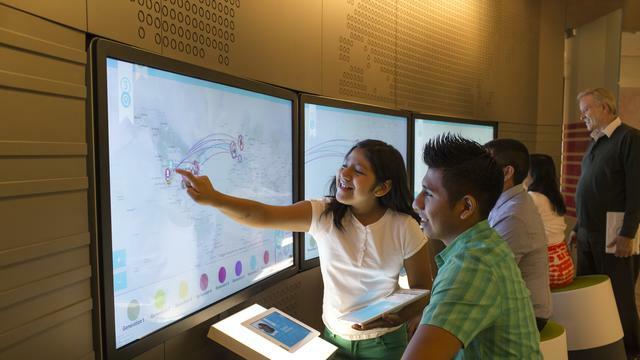 Other research by the missionary department has revealed that of more than 5,000 LDS converts surveyed, 25 percent said a visitors center influenced their decision to investigate the church. A study involving 10,000 converts in the United States showed that 32 percent had visited a visitors center before investigating the church. In 2015, more than 6 million people visited centers, with tens of thousands requesting missionaries after their visits. Sisters missionaries facilitate referrals, stay in touch with people after they leave, and when not outside, answer questions and interact with people online through Mormon.org inside the center, Lusvardi said. We are focused on teaching nonmembers, but visitors centers are also for our members. It was a life-changing experience (for my family) to see those places and connect with what happened there. Their faith has been greatly strengthened. It’s a big thing for members, I think, to feel the spirit at these centers and sites. A June 2015 Ensign article shared a few examples of both LDS Church members and those of other faiths having spiritual experiences at visitors centers. One of those recounts how Rachel Magaoay, of Honolulu, was visiting a friend in Utah who took her to Temple Square. While watching “The Testaments” she had a spiritual experience. Magaoay later met with missionaries, investigated the church and was baptized. She went on the serve a full-time mission and was called to Temple Square. “I continued to feel the same spirit I felt when my friend took me to the visitors’ center and the Holy Ghost bore witness to me,” she said in the Ensign article.